It has occurred to the supreme leader of the Indigenous People of Biafra (IPOB), Mazi Nnamdi Kanu, his statement(order) to boycott Anambra election, which reads “there will be no election in Anambra State come November, 18th 2017 and there won’t be any going back until the Nigerian federal government gives a date for Biafra referendum”, has been misinterpreted by some group of individuals, politicians who claimed that he has no right or shouldn’t have issued such an order. 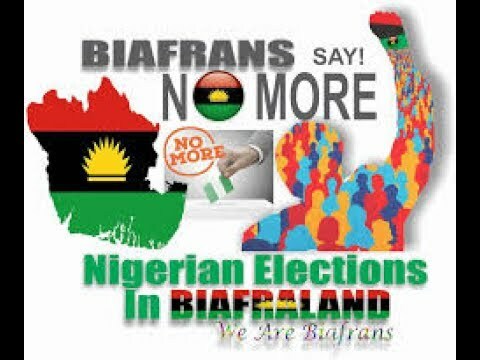 The group pointed out that it will be through the election that Biafrans would elect politicians that would speak for them in the Nigerian federal government to fasten Biafra restoration. The activist then asked; “Where are those politicians, when Biafra land is left in a mess, where are the politicians, when Biafrans are killed in their own land, woman, and girls raped and molested”. “Where are the politicians, when the Biafran Youths scatter all over the world in search of greener pasture, after years of unemployment, where are those politicians”. Biafrans, it is high time we face the reality and tell ourselves the truth if actually we want Biafra to come, because participating in the forthcoming election in Anambra State, shows that we Biafrans are not serious before the International Community and are clearly happy with the Nigerian federal government that has perpetrated all manner of humiliation and killings to Biafrans. However, going by history, there is no country in the world where a section is seeking for a self–determination and at the same time participating in the electoral activities of the same country they want to secede from, because if they do, it means that they are deceiving the public about their quest for freedom. Thus, all Biafrans are hereby advised to adhere to the order, as this is a time to test our fate in the Biafra restoration and right to self-determination.